The 49ers dropped another game and fell to 2-10 this season after losing to the Seattle Seahawks 43-16 on Sunday. Collectively, it was a total team effort in the loss. Individually, there were some standouts, but for the most part, the 49ers were seemingly overmatched in every phase of the game. Quarterback Nick Mullens was 30 of 48 for 414 yards, two touchdowns, and one interception. Receiver Dante Pettis led the way with five receptions for 129 yards and two touchdowns. Running back Jeff Wilson Jr was the leading rusher with 15 carries for 61 yards while Matt Breida, who tweaked his ankle in warm-ups, only carried the ball five times for six yards. He added three receptions for 51 yards as well. On defense, the 49ers just ran up against a superior offense and quarterback even though the they were able to largely have an answer for everything the Seahawks threw at them. They just couldn't cover or hang with the receivers. And Russell Wilson is just a better quarterback. The Seahawks offense is also still stacked with talent that was able to fight through the 49ers game plan. Defensively, it wasn't a matter of the game plan not being solid. 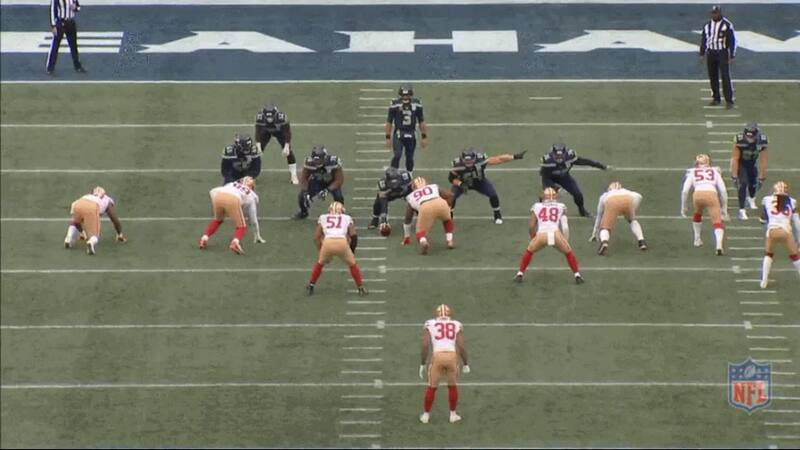 The 49ers had answers for most of the concepts the Seahawks threw at them. The difference was in the lack of execution and the superior talent the Seahawks have at nearly every position on offense. Seattle ran a lot of trips formations against the 49ers defense, to which Saleh schemed cover-3 "mable" and cover-6 "skate" to compensate. Players found themselves in position for the most part only to be outdone by poor execution and better talent and offensive play calling by the Seahawks offensive coordinator Brian Schottenheimer. 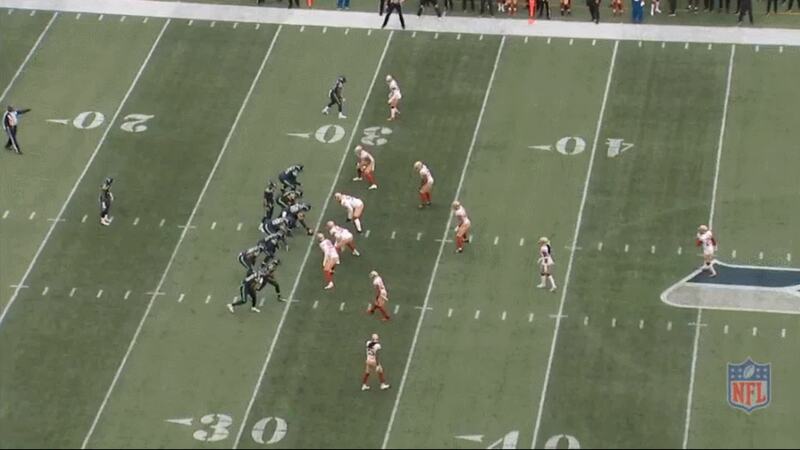 One of the ways the Seahawks exploited the 49ers defense was through the use of trips sets of receivers. The cover three defense is a sound scheme when the defense has talent that can range and cover the field with the league's best athletes. If it doesn't, an opposing offense will carve it up away from the individual strength by creating match-ups post-snap that exploit the natural holes the defense leaves open. Matty F. Brown, whose work is linked below, said of the Seahawks game plan and Schottenheimer more specifically that "Schottenheimer's usage of personnel, trips formations and route combinations shattered the cover 3 rules of Saleh. Mable and skate were dealt with. Schotty out-adjusted his opposing tactician." One way a team will match-up against an offense running trips formations is playing a Cover-3 "Mable" coverage. It's important to note that this is the terminology used by Nick Saban's Alabama defense and not necessarily what it's called in the Pete Carroll/Gus Bradley/Robert Saleh lineage, though the assignments don't really change. Mable is a Cover-3 shell with a man coverage corner to the single receiver side away from the passing strength. One of the ways teams can beat this coverage is by running a deep crossing route away from the zone coverage side and forcing the WILL linebacker to cover the crossing route since it creates a favorable match-up. The Seahawks did this a number of times and with a shallow cross or dig that pulls the man coverage corner away from dropping underneath the deep cross to help. 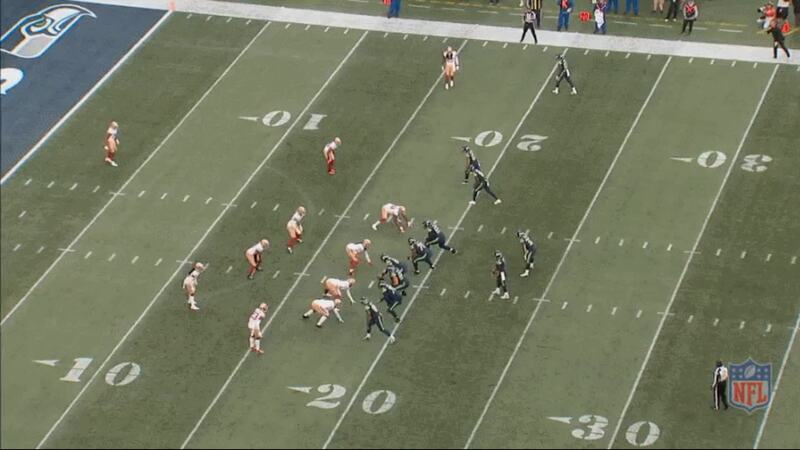 Here late in the first quarter, the Seahawks lined up in a shotgun trey right formation running a naked boot similar to Shanahan's "fake 19 wanda" boot pass. In "mable" here, Ahkello Witherspoon (No. 23) is in man-to-man bump and run coverage on the single receiver side at the top of the screen. Fred Warner (No. 48) should be looking for any deep crosser from the trips side that comes in his zone. Receiver Jaron Brown (No. 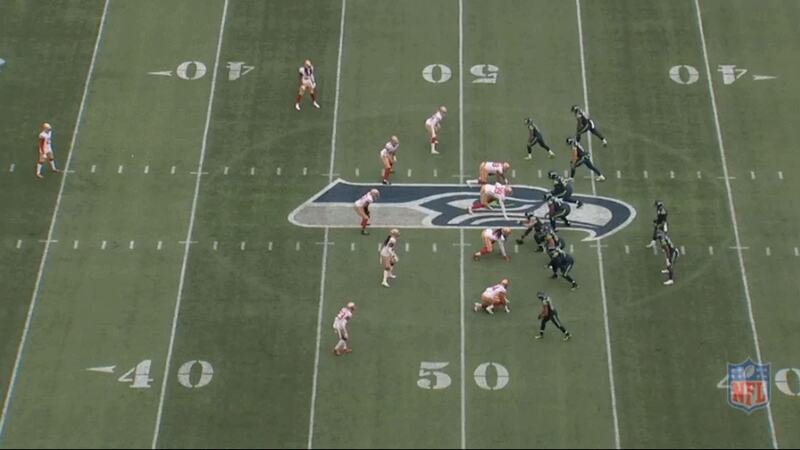 18) is the outside receiver in the double stack and bluff blocks down the line on Wilson's hard play fake. Warner sees no crosser as the inside slot receiver bends in before breaking out on the corner route. No one is even looking at Brown as he leaks underneath the coverage down the left sideline from the right side of the formation. Wilson connects with him as no one is even near him for a 45-yard gain. This isn't so much about a breakdown in coverage as it is just a well-designed play off of a 49ers defensive scheme tendency. We can't know for sure what specific adjustments were made, but we can see them on film, and the Seahawks had other answers for that as well. On the Seahawks' second big pass play of the first half, Wilson connected with Tyler Lockett (No. 16) for a 52-yard touchdown on first-and-20. The Seahawks were again in a shotgun trips right formation running a 3-verticals concept from the trips and a shorter flat/shallow cross combination from the left to occupy the man coverage defenders. Witherspoon is in off-coverage but is man-to-man as he runs with the shallow crosser. Lockett is lined up in the middle of the trips bunch on the line of scrimmage running the deep crosser as tight ends Nick Vannett (No. 81) and Ed Dickson (No. 84) released outside on verticals down the seam and sideline. Against 12 personnel (one running back, two tight ends), the 49ers almost always play base defense as 12 personnel is a run game grouping. Witherspoon plays the shallow crosser as Lockett releases deep across the field. 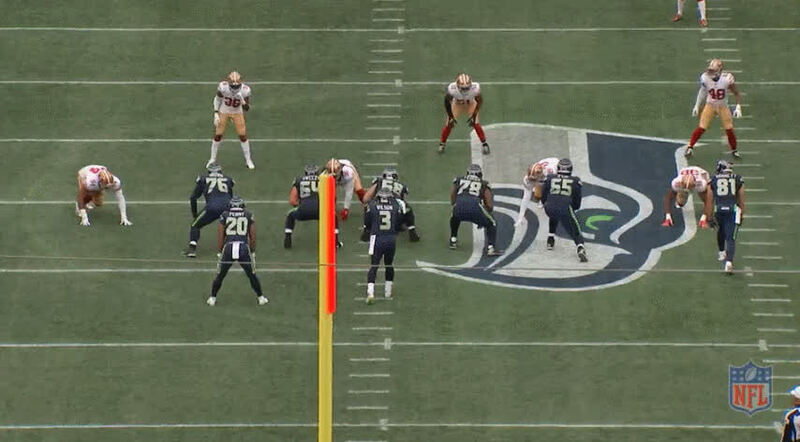 The 49ers are playing a variant of the cover-3 "mable" called cover-6 "skate". "Skate" and "mable" are schematically identical. The zones remain the same and the man coverage bump-and-run corner remains on the weak side away from the passing strength. The difference is in the alignment of the strong safety (or "star" defender in Saban terminology). The strong safety in "skate" aligns over the weak side and has responsibility for the number four (the running back) out of the back field or to drop with the first shallow or underneath crosser from the trips. In skate, the safety rotation is to the weak side, in mable, the safety rotation is to the strong side. Malcolm Smith turns and runs underneath Lockett playing a ROBOT technique (rob underneath deep crosser) step for step as he's supposed to do in that situation. 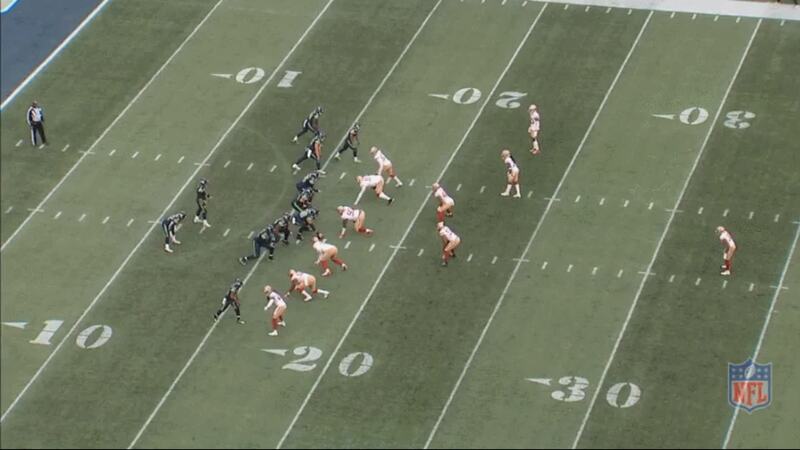 The play call was sound as Smith was in prime position to force Wilson into a tight coverage throw over the top. The pass was underthrown as a result but Lockett gets away with a blatant push off and Smith never recovers. Lockett strolls into the end zone for six. Later in the third quarter, the Seahawks run the same exact play as the long touchdown to Lockett above, a switch release, 3-verticals concept. With the 49ers back in "mable", Saleh made an adjustment this time to have the free safety shaded over to the weak side to enable him to bracket the deep crosser if it comes his way. If not, he can cloud over the double verticals and provide coverage there. Lockett is middle slot again in the trips bunch with Vannett inside and Dickson outside. The play is the same as above just flipped with the vertical routes coming from the left this time instead of the right. Safety Antone Exum (No. 38) brackets Lockett's crosser with Smith and there's no throw so Wilson comes off underneath to Baldwin. The 49ers also sent the fire zone blitz underneath the coverage to the strong side and dropped the weak side end into the curl flat. Wilson sees the deep cross covered and no window and immediately comes back underneath to Baldwin on the short cross. Baldwin catches the pass as Sherman goes to tackle him but couldn't wrap him up around the waist. Baldwin gains 25 on second-and-21 before being tackled. The scheme adjustment worked and took away Wilson's options downfield but the 49ers could not execute due to poor tackling by Sherman. Against trips again on a late touchdown to open the fourth quarter, the 49ers are back in "skate" coverage again. Due to a lack of a pass rush, the coverage could not hold long enough before Wilson eventually found a receiver in the back of the end zone. 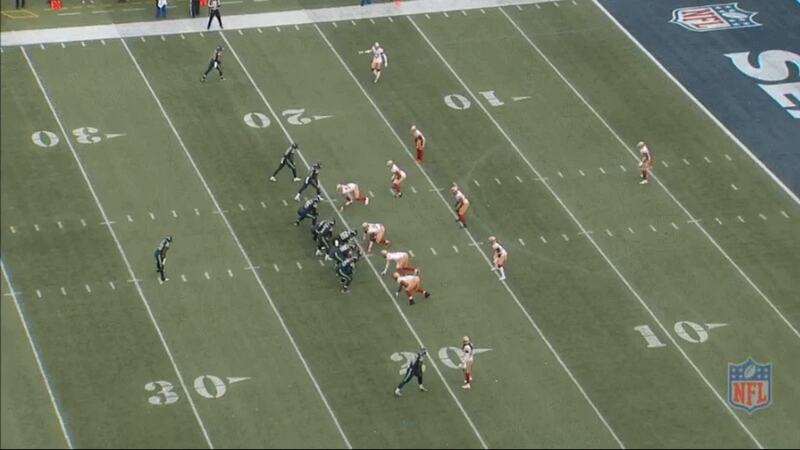 The Seahawks are in a shotgun trips right formation with a twins stack on that side. Wilson motions the farthest receiver, David Moore (No. 83), back into the formation to create a trips bunch with Jaron Brown (No. 18) and Doug Baldwin (No. 89). The Seahawks run a receiver screen fake to the right with Moore as the decoy screen while Baldwin and Brown stack release and run verticals down the sideline and seam. Baldwin helps sell the screen with a bluff block and gets the 49ers hook and flat defenders to bite on the screen. Saleh's adjustment with the strong safety Marcell Harris (No. 49) blanketed Baldwin's crosser and robbed Dickson's deep dig route underneath in the end zone, taking away Wilson's window to throw. However, Wilson breaks the pocket and finds Brown, who scrambled away from Sherman's coverage, in the end zone for a touchdown. The Seahawks continued to punish the 49ers with the use of trips in the run game as well, when they scored a touchdown on a toss crack play to running back Rashaad Penny to open the second half after a Lockett kick return of 84 yards to the San Francisco 20 yard line. Wilson tosses the ball out to Penny running to the left behind the trips. David Moore crack blocks on defensive end Cassius Marsh (No. 54) and Jaron Brown reaches the second level to block Warner. Left tackle Duane Brown (No. 76) kicks out nickel corner K'Waun Williams (No. 24) who was scraping over the top to force Penny back inside. The bust on this play is Warner, who tried to slip underneath the second level block of Brown instead of trying to scrape over the top to force Penny back inside. After Penny reaches the second level, it's on the safety Exum and the play side corner Witherspoon to come down and make a play but both make a business decision to pull-up and not take on the back as he's running at them. Penny walks in for six. It's clear the defensive issues this year are lack of talent first and foremost and a lack of execution close behind. Schematically though, I don't think it's fair to call Saleh's game planning into question just yet, as they are making adjustments on the fly throughout the game and over the course of the season. The execution and talent level just aren't there yet in a team that has played 11 of 12 defensive draft picks from 2017 and 2018 over the course of the last two seasons. They're still fielding a relatively young and inexperienced defense intermixed with some older veterans and they're playing like it. No one should be surprised by this. Hopefully adding the pass rusher in the draft will take this defense to the next level. Matty F. Brown's work in Seattle's defense can be found here and here. All statistics courtesy of Pro Football Reference unless otherwise stated.